3 Beds 2 Baths 2,055 Sq. ft. Description: Enjoy Florida your way in the carefree single-story Saint Thomas floor plan. 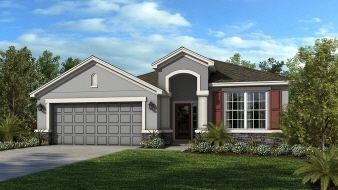 This new home in Orlando is 2,055 square feet of space designed for maximum livability. An inviting porch ushers you into the foyer. Just to your right you’ll find the study, your own private retreat for reading, writing, hobbies or home business. Continue down the foyer, through the rotunda and into the gathering room. This is where friends and family will find a warm welcome, enhanced perhaps by the enticing aromas of something yummy you’ve prepared in your chef-inspired kitchen. Serve casual meals in the dining nook, sit-down suppers in the formal dining room, or fast snacks from the counter. Or take the gang outside and dine al fresco on your lanai. Relax and revitalize in your secluded owner’s suite. Sought-after features include twin walk-in closets, oval soaking tub, dual lavatories, walk-in shower and enclosed commode. That’s a lot of luxury and it’s all yours. Secondary bedrooms share a full bath.